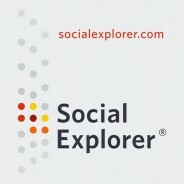 An online demographic research tool, Social Explorer revolutionizes the way researchers, scholars, and students interact with data. Containing all historical US census data from 1790 to the present and simple mapping and reporting tools, it meets the needs of experts and non-experts alike. The U.S. Census first collected data on librarians in 1880, four years after the founding of the American Library Association. They only counted 636 librarians nationwide. Indeed, one respondent reported on his census form that he was the “Librarian of Congress.” The U.S. Census, which became organized as a permanent Bureau in 1902, can be used to track the growth of the library profession. 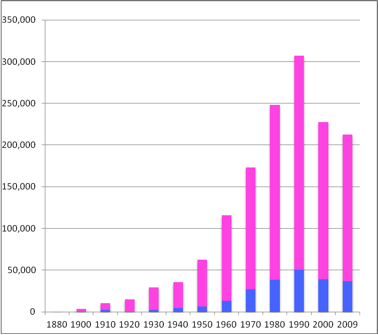 The number of librarians grew over the next hundred years, peaking at 307,273 in 1990. Then, the profession began to shrink, and as of 2009, it had dropped by nearly a third to 212,742. The data enables us to measure the growth, the gender split in this profession known to be mostly female, and to explore other divides in income and education, as they changed over time. We examined a number of socioeconomic trends over the duration, and focused in on 1950 the first year that detailed wage data were recorded, 1990 at the peak of the profession and 2009 the most currently available data.1 We looked at data within the profession and made comparisons across the work world. 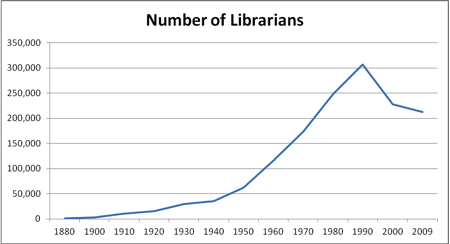 For the first 110 years of data, the number of librarians increased, especially after World War II. In 1990, the trend reversed. Over the past 20 years, the number of librarians has dropped by 31 percent, though the decline has slowed. Considering the nation today, the states with the largest librarian populations are: Pennsylvania, Illinois, New York, Texas and California. Meanwhile, the states with the highest concentrations of librarians (or librarians per capita) are: Vermont, D.C., Rhode Island, Alabama, New Hampshire. Table 1 in the appendix gives the count and proportion of librarians by state in 2009. The Census Bureau has kept records of librarian wages since 1940. 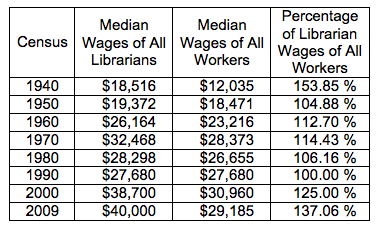 Median2 librarian wages (whether full-time or part-time) increased until 1980, though they were a lower percentage of the median wages of all workers. Indeed, between 1970 and 1980 librarian wages declined nearly $4,000—more than twice the drop of median wages across all professions. (This wage drop was in the context of the Oil Embargo in the mid-1970s, and the economic fall-out that that caused.) In 1990, librarian median wages declined further and were the same as those for all workers, but by 2009 they had gained in relative terms, and reached their peak of $40,000. (All these figures are adjusted for inflation.) By 2009 the typical librarian earned over one-third more than a typical US worker. According to the Census results, librarians have enjoyed consistently high employment rates. For instance in 2009, the unemployment rate among librarians was just two percent; one-fifth the national rate. Today, 83 percent of librarians are women, but in the 1880s men had the edge, making up 52 percent of the 636 librarians enumerated. In 1930, male librarians were truly rare, making up just 8 percent of the librarian population. Librarians working full-time earned more than the national median income in 1950 and 2009, but incomes dipped below the national median in 1990. Female librarians consistently out-earned women elsewhere in the labor market. 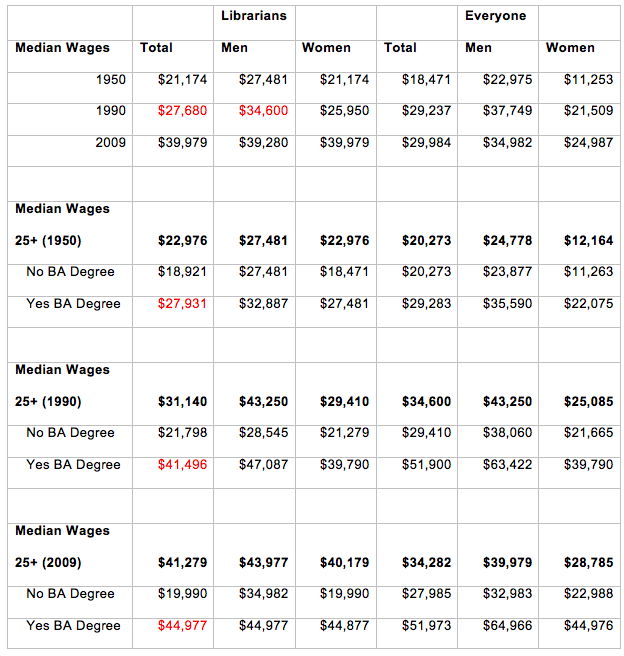 However, when tracking education and wages, librarians with BA degrees (or graduate degrees) consistently earn less than their counterparts elsewhere in the labor market. Looking at gender, male librarians out-earned female librarians in 1950 and 1990, but by 2009, median wages for the two sexes were within $100 of each other. The gender wage gap has essentially closed for librarians with college degrees, but among those without college degrees, the gap remains and is 50 percent larger than for those working in other professions. In 1880, one in three librarians were married. 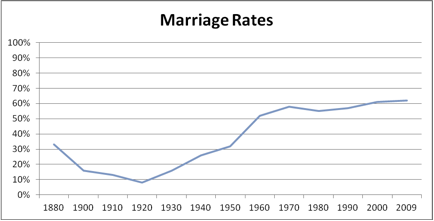 The wedding bell rate declined to less than one in ten in 1920 before turning around and rising for the next several decades. Today, the marriage rate among librarians is the highest it has ever been with 62 percent of librarians married in 2009. In 1940, when education data for librarians debuted, 45 percent of librarians had completed at least four years of college. That proportion has risen over the decades to 86 percent in 2009, over three times the national rate of 28 percent. 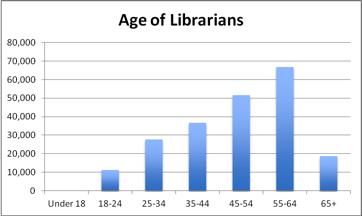 Librarians skew older with 64 percent of them 45 years or older, and 40 percent of them over 55 years old. The librarian population has aged over the past couple of decades. In 1950 and 1990, only 42 percent of librarians were 45 years or older, but by 2000, 64 percent were at least 45 years old. In 1950, 37 percent of librarians worked in the private or nonprofit sector while 62 percent worked in a public setting (the remaining 1 percent were self-employed). In 1990, 48 percent of librarians worked in the private or nonprofit sector, with men and women represented in almost equal numbers. In 2009, the number of librarians in the private or nonprofit sector decreased to 32 percent. Thus a large fraction of the decline in the number of librarians has come from their decline in the non-public sectors. Starting from a very small beginning, librarians grew into a large profession after in the mid-20th Century. Like other professions related to the media: books, newspapers, magazines, recorded music and movies, the internet seems to be having an effect on the field, as it has faced a significant decline since 1990. That decline seems to have slowed substantially since 2000, as librarians adjust to and find new roles in the internet age and the extensive increase in information that it has brought about. This analysis, which is preliminary, is based upon the original Census materials organized by the Minnesota Population Center. They are available as the Integrated Public Use Micro-data Samples (IPUMS). Available at www.ipums.org. In 1880 the samples include all of the Census responses in the entire country. Most decades the data only include a sample, generally one or five percent. As such the results presented are subject to sampling error, as well as issues related to Census response in general. Work is underway to make it possible for analyses such as this to be conducted in Social Explorer funded by the National Institutes of Health. The median represents the person in the distribution who is in the exact middle. It is usually used rather than average to depict typical wages and salaries. Featured Image Credit: ‘Books, Library’, Photo by Unsplash, CC0 Public Domain, via pixabay. Andrew A. Beveridge, President and CEO of Social Explorer, is a Professor of Sociology at Queens College and the Graduate School and University Center of the City University of New York. This article was co-written with Sydney Beveridge and Susan Weber. Do you have any data on MLS librarians: numbers, salaries, etc. At Library Journal we’ve recently done a survey on job satisfaction, including salaries and changing roles/responsibilities. i am writing an editorial and would like to use your info as a starting point. It stuck in my mind in library school that ALA was founded the year of the US Centennial. Also Bell patented the telephone and Dewey published his classification system. Librarians, information technology, and organization of information. What is the basis for the conclusion that the Internet is responsible for the decline in library jobs? I would really like to see the supporting data. I’ve been working in libraries since the early 1990s, acquiring my MLS in 1998. I have never seen a position eliminated due to the Internet. Instead the Internet has caused a shift in workflow, and usually additional job duties for those already employed. If anything, the Internet has *created* positions, like my own digital services job. On the other hand, I have seen widespread budget cuts over the years resulting in hiring freezes, and (most insidiously) positions left unfilled when employees quit or retire. I would have thought the decline in positions could be directly traced back to the decline in funding. Of course, a lot of people seem to think librarians have become extraneous due to the proliferation of information on the Internet. That makes it easier to justify cutting our funding. So maybe in a roundabout way the Internet is responsible, but that was not the implication in the article. Very interesting article that goes a long way towards debunking a lot of myths about librarians. One of the great ironies of the digital age is that librarians seem to be busier than ever. Libraries in the U.S. are packed, and the ever growing selection of media within the library only makes their role more valuable. Great article! This wonderful views expressed above will be road stone to other fruitful writings.